I hate building. During my time in SL, I have avoided anything that required me to build anything like the plague. This time last year, Sian Pearl taught me how to doctor prims (using the same interface as the build-interface), and I was really pleased with myself that I could now pull bits off outfits that I didn't like. I cannot tell you how many hours have gone into making Kitti's collars fit. In my defence, I am running SL on the lowest graphic settings, and I lag like Hell most of the time. I bravely attempted to put my settings up to "medium" - daring, I know! - this morning, and I was doing just fine, but Kitti's face kept melting into a pink and white blur every twenty seconds or so, and I got bored having to rebake the textures. So back down to "low" I went. But yes: I hate building! It's not, really, the most difficult thing in the world, but the SL camera is unforgiving, and it makes it look as if things are resting on the ground when they are actually floating, and I imagine that working on small things such as building the beautiful pieces of jewellery SL designers put together, or creating hair, must take forever. I found it hard enough to make my walls join in the corner properly, and it made me feel...well...as thick as a brick! It took me, with the kind and patient help of Sian Pearl, two-three hours of sweat and blood and tears and God only knows what else, to build a window and encase it in wall. I kid you not. 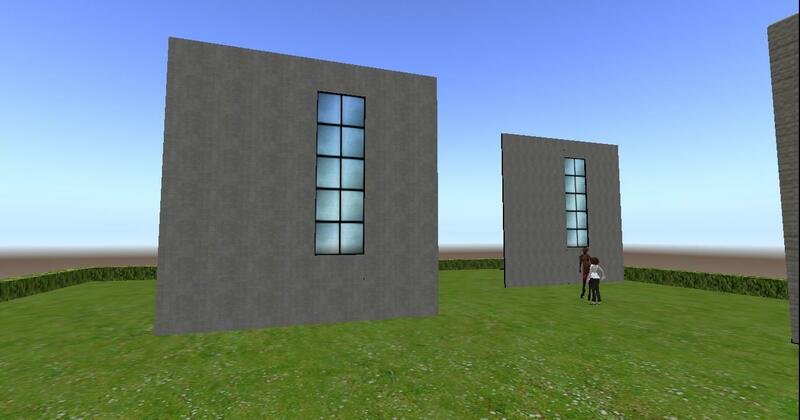 But I persevered, and now I have a really cool wall with a window, and (what I think is ) a pretty cool virtual stage-set for the adaptation I am writing for my upcoming Dramaturgy Exam Presentation. It all begins with a cube. Damn. Cube. I built a window - that you can see through! I give you, my stage-set! My Dramaturgy Exam Presentation is one of the biggies. This is my last year at uni, and I need to do well in this exam. The task is to create a (live, so, theatre rather than film) stage adaptation of, well, anything we like really, and present it to the class as if to a board of investors. I need them to be able to see my show perfectly, else they won't want to invest and I won't get the grades I need to graduate with the mark I want. I have written a pretty adjective-heavy description of the piece, but for the visual people in my class (including the lecturer), I needed to have something more concrete. And my drawing skills are...well. Let's not talk about those. We were told to download Blender, a software package that allows you to build things, basically. It is used in game design and things like that. I tend to be quite good with technology, but I missed the Blender master-class because I had another lecture, and when I loaded Blender up, I died a little inside. So. Many. Buttons! Deciding I didn't feel brave enough to tackle the Blender interface, I turned to SL. Now, it is my understanding that SL uses a very similar, if not the same, building system as Blender does, but it has a much, much simpler interface. And I appreciate a simple interface. I even costumed Kitti, and got hold of some poses so that I could place her in the scene the way I imagined my central character would be placed. I am quite pleased with the outcome, though my screenie isn't the best. What I really like about it is that I could load SL in my presentation and allow the class to walk around the set, as Kitti-in-character-costume, and see it for themselves. Maybe I'm just easily amused. I'd better get a good mark for this!